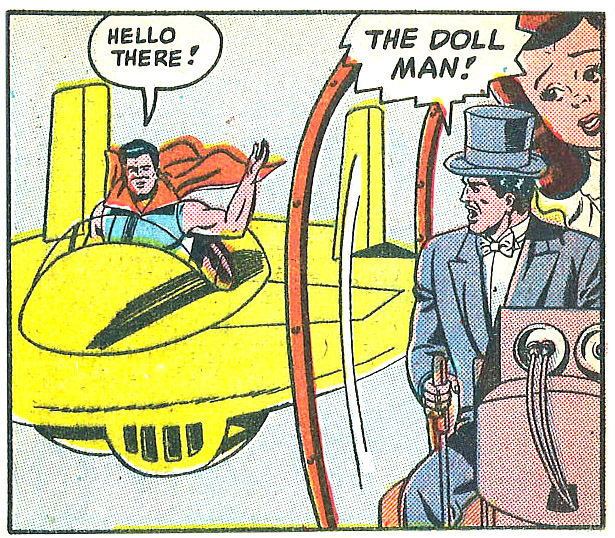 The Doll Man holds the title for being the first super-powered hero published by Quality Comics. He was however, preceded by four costumed heroes (the Hawk, the Clock, Bozo the Iron Man and the Invisible Hood). Like many of Quality’s most memorable heroes, he was created by Will Eisner (before his split with Jerry Iger). Today Doll Man’s appearances on the covers of Feature Comics are classics. 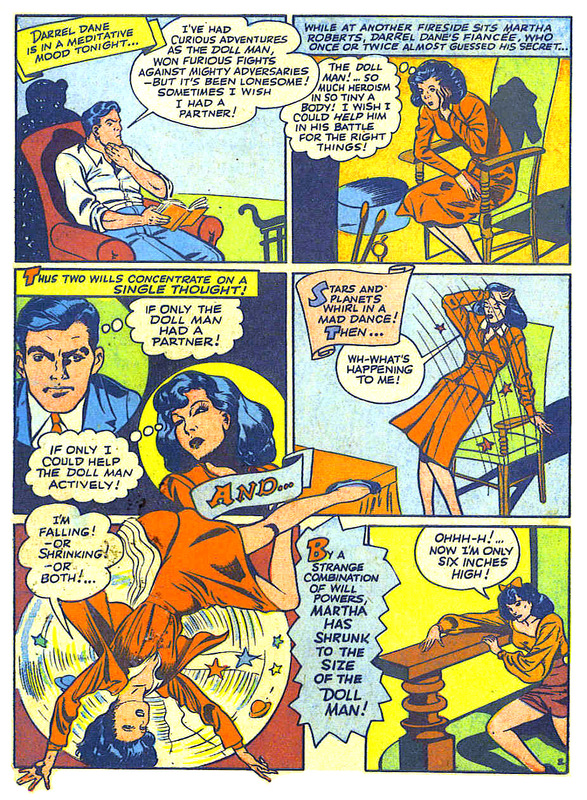 Many of them were drawn by Gill Fox, who began with Feature Comics #54 (1942). Inside, the feature was a proving grounds for exceptional talents like Lou Fine, Reed Crandall, and Al Bryant. The feature was a favorite among readers—and Busy Arnold himself, who later promoted the character to its own solo title. Feature #27 (1938). Art by Will Eisner. Shrinking much like his DC successor, the Atom. 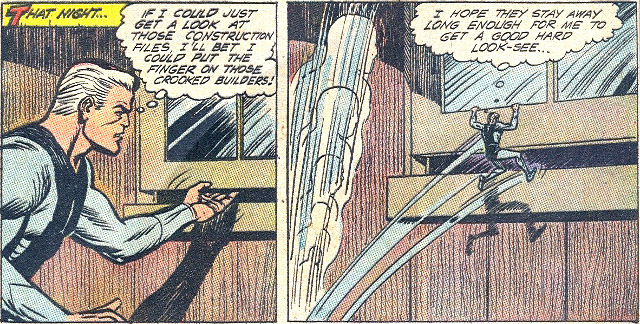 From Feature Comics #47 (1941), Art by Reed Crandall. Martha becomes Midge! From Feature #77 (1944). The Undertaker, from Feature #91 (1945). 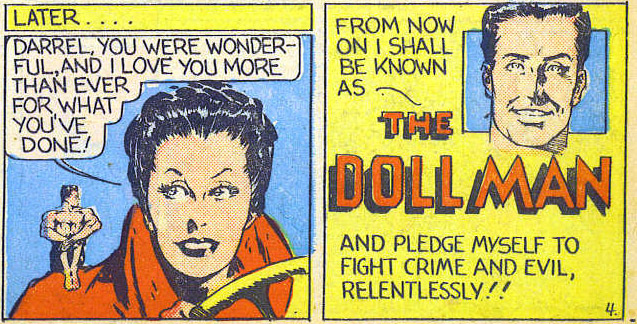 The Dollplane, from Doll Man #22 (1949). Doll Girl arrives! 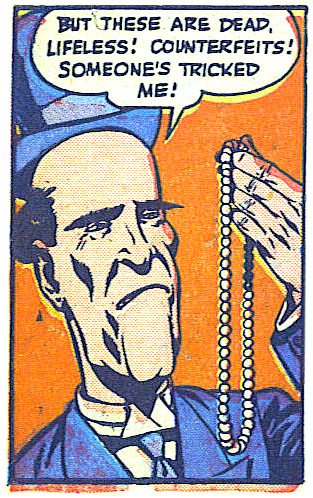 From Doll Man #37 (Dec, 1951). Tinyman, from Captain Marvel #4 (1966). Art by Carl Hubbell. 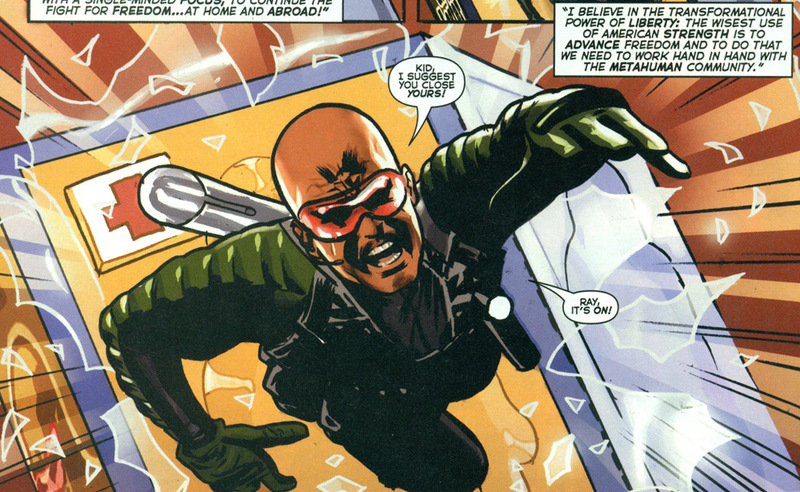 Lester Colt, from Uncle Sam & the F. F. v.1 #1 (2006). Art by Daniel Acuña. In early 1966, an ambitious publisher launched a strange reinvention of Captain Marvel. In addition to pinching Plastic Man, the second issue introduced a mighty mite called Tinyman—Plastic Man’s ally and Captain Marvel’s enemy. Like Doll Man, Tinyman could shrink. He was a circus performer who in the fourth issue actually reformed and became Captain Marvel’s ally. DC’s shrinking Atom hit stands later that same year. 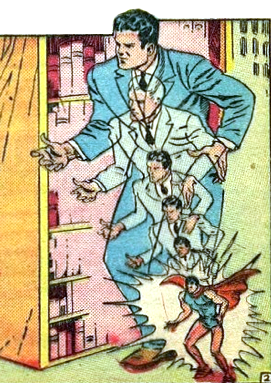 Tinyman returned in two issues of Captain Marvel presents the Terrible Five (1966–67). A pair of young heroes once took the names Doll Man II and Doll Girl II. This pair were apparently a couple and attended a recruitment party for Teen Titans in Los Angeles. (Titans Secret Files #2) It is unknown what relation, if any, these two had to the originals. This Doll Man presumably changed his name to Molecule and briefly joined the Titans at a time when the team was in much turmoil. ( 52 #32, Teen Titans v.3 #38) He was killed by the Terror Titans’s Persuader (Terror Titans #1) Doll Girl’s fate is unknown. Originally, Doll Man III was trapped at six inches tall. With the help of his wife, Emma Glenn, he can now change between that and full height. When small he also appears to possess super-strength and density control.